A deposit of 50% and full credit card details will secure your reservation. Deposits made to guarantee are non refundable. The balance of accommodation is to be paid on arrival. For cancellation up until one month prior to expected arrival the guest will be liable for the full deposit. For cancellation within 30 to 14 days of expected arrival, the guest will be liable for 75% of the total accommodation cost. For cancellation with 14 days of expected arrival, no show or early departure, the guest will be responsible for the full accommodation fee. Refunds of deposits/prepayments for bookings are at the discretion of management and are dependent of the ability to relet rooms. All major credit cards are accepted except of Diners Card. Rooms that are not occupied by 18h00 will be seen as a NO SHOW, unless prior arrangement have been made. R 450,- will be deducted from the credit card, if the room key is lost or not returned upon departure. The magnificent point between ocean and mountain has made Cape Town one the most beautiful cities in the world. 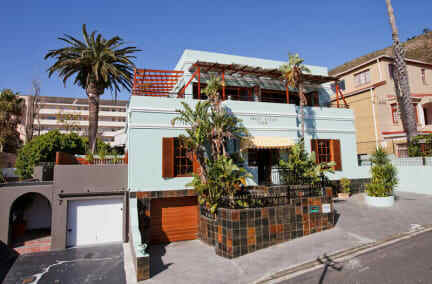 The Sweet Ocean View Guesthouse is situated in Upper Sea Point, one of the most popular suburbs with fabulous views over the Coast of the Atlantic Seaboard. Small Shops, Cafes and Restaurants are all within walking distance on the Main Rd. of Sea Point. This gorgeous Cape Town Mansion was recently entirely renovated by their Owners to one of its kind and outstanding accommodation facility with state of the art interior design. 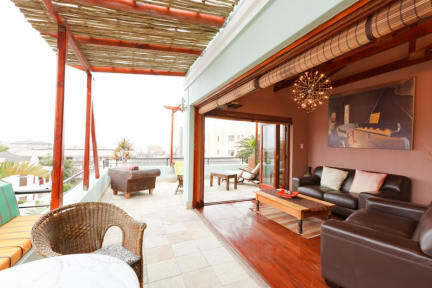 On the 50qm roof terrace you enjoy sunbathing over the roofs of Sea Point. Refresh in between by taking a shower on the roof terrace and relax while bathing in the Jacuzzi with the majestic Lions Head watching over you. Enjoy the full continental breakfast on the lower terrace and watch how your breakfast is prepared in the living kitchen on the cooking island. Each room incl. the en suite bathroom are all individually furnished and designed to one of its kind and outstanding with a personnel touch. Minisafe and TV are standard. The Lounge offers not only a flat screen TV, you will feel like home on the comfortable leather couches with the view over Sea Point to the Lions Head as well as over the Atlantic Ocean.